What would life be like without family or friends? Our personal relationships help us celebrate the joys in life. They also help us through difficult times. Yes, they can be frustrating at times … but no one is perfect. Take time to express your gratitude to those who matter the most to you. Use these personal relationship tips as inspiration to take action. Every Monday we share on Twitter a helpful tip. Click on the tip for more information. 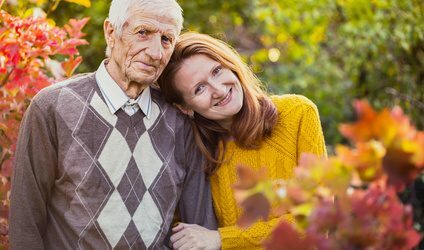 Gradually introduce the idea of assisted living to your aging parent – they may see it as losing their independence instead of a safer environment with people similar to their age. Be present with the person you are with and stop phubbing (snubbing someone you’re talking to in order to look at your smartphone). Join your spouse in their newfound need for adventure during their midlife crisis – it may actually bring you closer as you share new adventures. Even when life becomes crazy hectic, show your spouse meaningful appreciation – feeling valued in a relationship goes a long way. One of the 5 P’s of Life is “Personal Relationships” – your relationship with others, including your spouse, significant other, parents, other family members, and friends. To build and strengthen these relationships it’s important to dedicate time to them – no matter how busy life becomes for you. 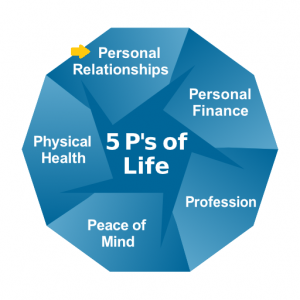 Transition Planning & Guidance, LLC, (“TransitionPG®”) looks at all aspects of life using the 5 P’s of Life – personal relationships, personal finance, profession, peace of mind, and physical health. While money helps you achieve many goals, it’s not the only thing to consider when developing a financial plan. Our mission is to help you define and achieve your financial, personal, and professional goals – especially during life transitions. Through our planning services and guidance plans, you take control of your money and life.